The focus of this month’s café was Environmental Science and Justice. Ms. Ortiz, an environmental scientist talked to the students about her journey to become a STEM professional and what she does in her current role as an environmental scientist. Ms. Ortiz explained the role of government agencies (local, state and federal) in protecting our environment. She spent most of the café speaking about managing our resources in particular non-renewable and renewal energy. She also spoke with the teens about environmental justice, how certain communities are negatively impacted by waste, pollution and blight. Ms. Ortiz’s hands on activity focused on teaching the kids about non-renewable and renewable energy and the importance of conserving our resources. At the end of the café, Ms. Ortiz gave 4 students a graphic novel with a young girl of color that was focused on getting environmental justice for her community. The big idea that Ms. Ortiz got across was how that some of the resources that we use today are limited (non-renewable); therefore we must do our best to conserve them. 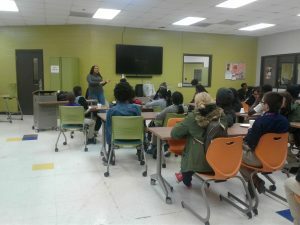 Interactions amongst the teens and Ms. Ortiz was outstanding because of the topics that she discussed were something the teens were interested in and they wanted to learn more. The most by far coolest thing about the café was how the teens engaged in the activity to learn more about non-renewable resources and how we can conserve them. Ms. Ortiz’s activity was called Non-Renewable vs Renewable energy. The purpose of the activity was to teach the kids the importance of conserving non-renewable resources. Ms. Ortiz divided the students in group of four. She used popcorn (as the non-renewable energy source). The goal of the activity to teach the students how to make decisions about the use of their resources. The group had to decision how much of their resources that they are going to utilize and how much they will conserve. The activity went well because the team learned a valuable lesson about conservation of resources. It also helped them to understand non-renewable and renewable resources. It also helped the teens the understand the impact of society’s use of resources.